Are You Maximizing Your Organization’s Most Valuable Resource – Time? Time. There never seems to be enough of it. Nobody understands the elusive nature of time, and how to optimize it, better than Paul Burton. Paul left his career as an attorney to chart a different course: inspiring others to make the most of their time so they can regain control of their days, get more done and achieve greater personal and professional success. His compelling programs deliver unique ideas that challenge conventional wisdom and guide the audience to achieve more in their careers and personal lives. His warm sense of humor and in-depth understanding of the challenges faced by today’s workforce instantly engage his audience. Everyone in your group is guaranteed to learn something new about how to become more productive each day, how to perform at higher levels and, most importantly, how to take back control of their busy lives. 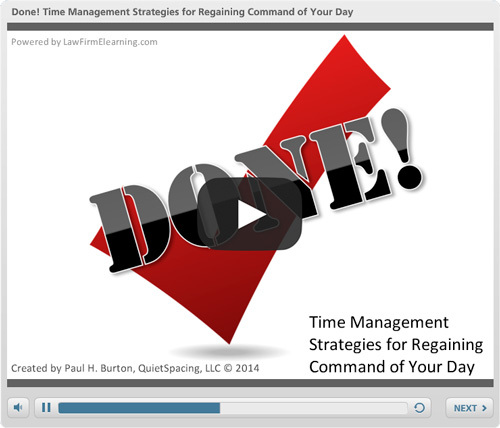 By following Paul’s time management techniques, your group will accomplish more and feel better about doing so. Our programs are separately developed for OnSite and OnDemand learning environments. Either way, your people get immediately actionable suggestions to help them meet their time management challenges. Pick from the 24 suggestions offered in this fast-paced, engaging and entertaining examination of our current working environments. Stop treading water and start experiencing greater productivity and work-life balance! Global: Staying Productive in the Modern Workplace Individual Productivity 75 Minutes The workplace grows more global every day. Others work while we sleep. This program delivers eighteen ways we can leverage our distributed work environments, continue to get our work done, and demonstrate leadership regardless of our title or position. Attend this program if you’d like to lean in and participate in the future of working. Done…Again: Ten New Ways to Make Better Use of Your Time Individual Productivity 60 Minutes Getting just a little more done each day adds up to a lot of productivity over time. This program helps you get things checked off the list while adding more satisfaction to your life. Wait! Why You Procrastinate & What You Can Do About It Individual Productivity 60 Minutes Ever wonder why you procrastinate? Does it impact your work and life? Would you like to do it less? This engaging, quiz-based program will arm you with facts and fixes to help you procrastinate less and get more done. Triage: Rescuing Your Inbox Email Productivity 60 Minutes We are overwhelmed with email. It’s distracting, frustrating and, sadly, necessary to get our work done. What if there was a better way to manage email? What if we could declutter our Inboxes and focus on the emails that truly need our attention? Get ready to tame your Inbox and regain command of the day! Read more. Send: A Dozen Ways to Make E-mail Productive Again Email Productivity 60 Minutes E-mail is the boon of the modern world and the bane for most of us working in it. We have a love/hate relationship with this digital communication technology. Why not use this powerful tool more effectively? Read more. Productivity 90 Minutes Moving from individual contributor to manager requires a new set of skills. This program focuses on the four C’s of success as a manager: Consideration, Collaboration, Communication, and Coordination. Read more. priorities they produce The Waterfall Effect – the resulting benefit that cascades down through the organization. This presentation sets forth six principles of productive leadership and offers eighteen immediately actionable suggestions to ensure leaders are making the best use of their time. Read more. Subscribe to the Six Minutes to Success monthly educational newsletter?